How is a Customer Advisor’s workday? You get to work at nine in the morning and sit down at your workplace with a smoking hot cup of espresso in the modern office that offers an inspiring view. Together with your colleagues are you answering questions, solve problems and tell the customers about the latest offers via email chat and phone. Your task is to make customers feel comfortable, safe and happy. You promptly respond to their requests and monitor incoming cases from customers via email. You care for the company’s good reputation and ensure that customers are satisfied with the response. If you are passionate about making your customers feel comfortable, is a nice future awaiting you. The management hopes to hear about your opinions and views from customers, which you report weekly based on your observations. Even if you are going to work with Finnish customers, it is highly appreciated if you master more languages. Then the phone isn’t ringing. you renew credit cards, review current interest rates on the loans, and review the status of outstanding invoices. Who is our new Customer Advisor? We believe that you have previously worked with customer service and want to take the next step into a fast-growing and professional corporation. Here you can be yourself and you are encouraged to bring your own thoughts and ideas about your work. The team spirit is strong and all new employees are given a warm welcome and rapid inclusion in the group. At regular intervals, the company and the customer service team go out and have dinner together, watch a football match or, if weather permits, a catamaran excursion to the Blue Lagoon may take place. 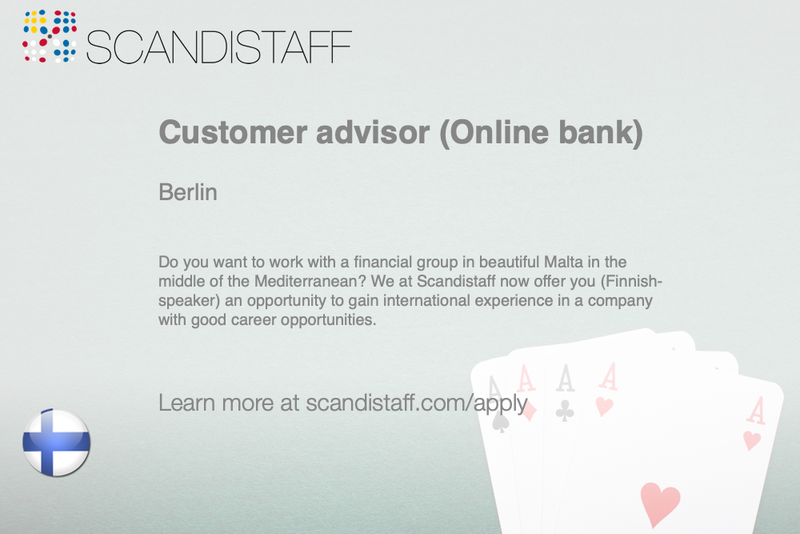 If you like the idea of working on an English-speaking Mediterranean island that offers fast career advancement, you should apply immediately! It is important that you are available fairly soon. Relocation assistance is provided. Do you want to be the Customer Advisor? The recruitment is on-going, so please apply immediately. Send your application through our website https://www.scandistaff.com/apply. Please note that we need the application in English. Tell us about someone you think fits the job and you will get a tip bonus if he or she gets hired. If you have questions, please contact the recruitment manager Carl-Henrik Larneryd at phone number: +46 (0)31-3139318. You can also reach us through our Skype client: SCANDISTAFF.